The Phoenix Sound Computer Interface gives our customers complete control of the sound board's terminals and what sounds can be triggered by them. 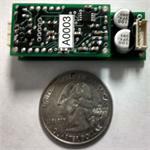 For Use with Phoenix PB11 Systems in size 1inch X 1inch X 3/8inch. This item is the coupler only. This system will work with DCC. Released in late 2017, the SM18 is our first DCC compatible sound board and motor combined board. Designed for locomotives with the Bachmann Large Scale Socket.. This system will work with analog DC, it has it own battery and battery charging circuit. Will also work with DCC. Will be sent with correct speaker for locomotive. Now with screw terminals.